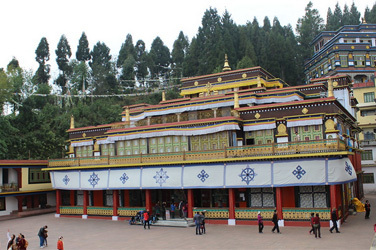 Tours in Sikkim is most refreshing tourism activities of India to explore the Sikkim and Darjeeling. Sikkim the former Tibetan Buddhist Himalayan kingdom - is without doubt one of the most spectacular regions in the world. For years, it was considered one of the last Himalayan Shangri-La because of its seclusion, magnificent mountain land, and ancient Buddhist monasteries. Sikkim's natural beauty of cascading waterfalls, vibrant terraced hills, pristine lakes, and snow-capped peaks offer a rare opportunity to experience one of the most inspiring environments in the world. Over time, the peaceful tenets of Buddhism have produced a humble and friendly people who truly enjoy sharing the unique treasures of their rich heritage. Their culture comes to life in art, mysticism, music, architecture, and religious traditions. In Sikkim, you will meet local artists and artisans in their studios and learn the timeless traditions of creating sacred art. As you explore the centuries-old monasteries, you will receive lectures from lamas and monks who impart their in-depth knowledge and personal experience. Your exciting tour also includes a visit to Darjeeling, one of the most charming towns in the eastern Himalayan foothills. Established by the British in the mid-19th century, Darjeeling is situated on a 7,000-foot ridge. It is surrounded by tea plantations and offers stunning Himalayan vistas including the 28,201-foot Kanchenjunga - the world's third highest mountain peak. We invite you to explore Sikkim's breathtaking landscape and fascinating Buddhist culture and discover why this is truly a remarkable part of the world. Join us and see why a Wisdom Tour offers a rewarding cultural exploration of the many facets of Tibetan Buddhist life, spirituality and history. We offer variety of tours in Sikkim and Darjeeling so if you are interested to travel in Sikkim for tour program please take look our designed programs if it is not suitable just let us know your interested then we will propose you new program itinerary just for you.